A haunting debut novel about a mixed-race family living in 1970s Ohio and the tragedy that will either be their undoing or their salvation. So begins the story in this exquisite debut novel about a Chinese American family living in a small town in 1970s Ohio. Lydia is the favorite child of Marilyn and James Lee; their middle daughter, a girl who inherited her mother’s bright blue eyes and her father’s jet-black hair. Her parents are determined that Lydia will fulfill the dreams they were unable to pursue—in Marilyn’s case that her daughter become a doctor rather than a homemaker, in James’ case that Lydia be popular at school, a girl with a busy social life and the center of every party. When Lydia’s body is found in the local lake, the delicate balancing act that has been keeping the Lee family together is destroyed, tumbling them into chaos. James, consumed by guilt, sets out on a reckless path that may destroy his marriage. Marilyn, devastated and vengeful, is determined to find a responsible party, no matter what the cost. Lydia’s older brother, Nathan, is certain the neighborhood bad boy Jack is somehow involved. But it’s the youngest of the family, Hannah, who observes far more than anyone realizes—and who may be the only one who knows the truth about what happened. A profoundly moving story of family, history, and the meaning of home, Everything I Never Told You is both a gripping page-turner and a sensitive family portrait, exploring the divisions between cultures and the rifts within a family and uncovering the ways in which mothers and daughters, fathers and sons, and husbands and wives struggle, all their lives, to understand one another. 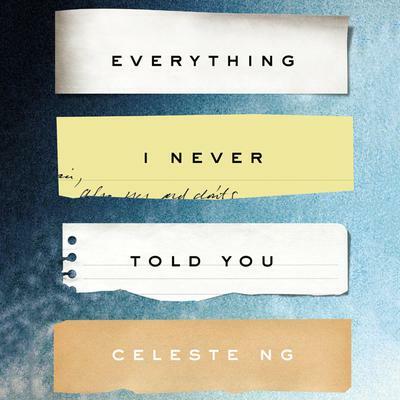 Celeste Ng is the author of the novel Everything I Never Told You. She grew up in Pittsburgh, Pennsylvania, and Shaker Heights, Ohio, in a family of scientists. Her fiction and essays have appeared in One Story, TriQuarterly, Bellevue Literary Review, and elsewhere, and she is a recipient of the Pushcart Prize. She attended Harvard University and earned an MFA from the University of Michigan. Currently, she lives in Cambridge, Massachusetts, with her husband and son.